This is a biennial that is usually grown as an annual. The plant produces a rosette of leaves the first year. In the second year, the plant sends up a flower stalk that produces seed, then it dies. There are two types-curled and Italian. 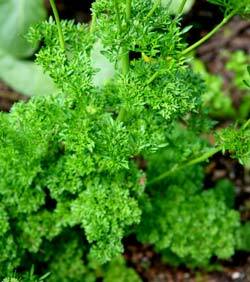 Curled parsley has crisp, tightly curled foliage. The Italian type has broad, flat leaves and a stronger flavor. Thus, it is considered superior for cooking purposes. Plant the seeds in early spring in medium-rich soil, either in full sun or partial shade. The seed germinates better if it is soaked in water for 24 hours before planting. Parsley can be harvested as soon as the plants are 6 inches tall. Harvest the outer leaves and let the inner leaves develop. The leaves can be stored fresh in a jar in the refrigerator or dried for later use. Parsley is one of the most familiar of all herbs. Though it has a characteristic flavor and smell, it is used to enhance the flavors of other herbs used. The green leaves of the curled type can be used in cooking but are primarily used fresh as a garnish. The leaves of the Italian type have a stronger flavor and are used fresh or dried in soups, stews, vegetables, salads, meats and poultry where a finer flavor is desired. Parsley makes an excellent garnish; also adds fresh flavor to everything from soup to salads.